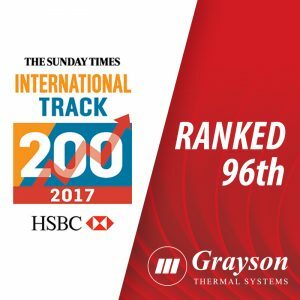 We are now ranked number 96 in the HSBC International Track 200 awards 2017 who take into account the amount of international sales, total sales and annual growth of a company over two years. We have had a 42% increase in international sales over the last 2 years and we are very pleased to be 1 of 20 UK Midlands based companies who have achieved a place on this league table. We hope to keep growing further and gain higher rankings in the years to come.